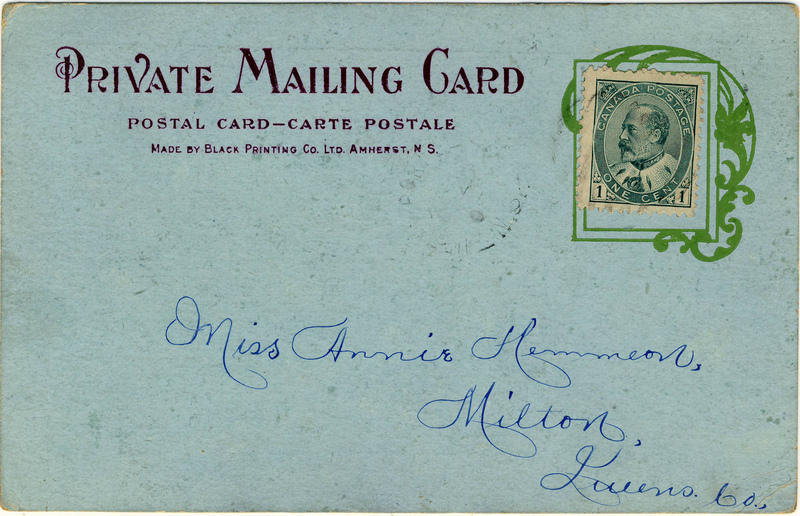 Many books on postcard themes have titles that include the phrase “Wishing You Were Here”, undoubtedly chosen because those four words evoke postcards as much or more than any others. And yet, as other collectors may also have noticed, the classic clichéd postcard message — which in its fullest form runs, “Having a good time. Wish you were here”– is actually not found with any frequency on old postcards. Truth to tell, I’ve never seen those exact words, even once, among the thousands and thousands of postcard messages that I’ve seen. That’s not to say that I don’t have a few postcards with variations on the “Wish you were here” part, but I’ve never seen anything approaching the whole thing. Having a good time here. Wish you were here. But for the first “here”, my prayers would have been entirely and perfectly answered, but (not being a fussy type) I think I can still declare victory. 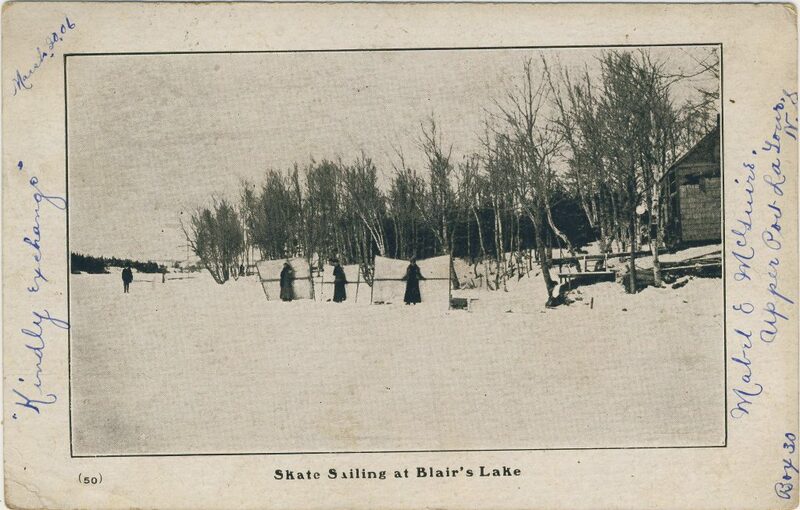 The greatest cliché in postcard history can in fact be traced to the earliest years of the fad. The mysterious “Leah”, who tantalizingly enveloped her own uncommon name in mysterious quotation marks, thus enters the ranks of the deltiological immortals. The elusive message, finally found (almost!). Did Miss Maggie McNulty appreciate the significance of what she’d received? Did Leah’s sentiment sound fresh and clever to her, rather than hackneyed? Wish we were there to find out! The postcard image is worth noting in its own right. It’s a charming example of an uncommon early style of Valentine & Sons postcards — a simple, uncoloured collotype. Grown children sometimes signed letters to their parents in a rather formal fashion, using their full first and last names, which would seem odd to us today. 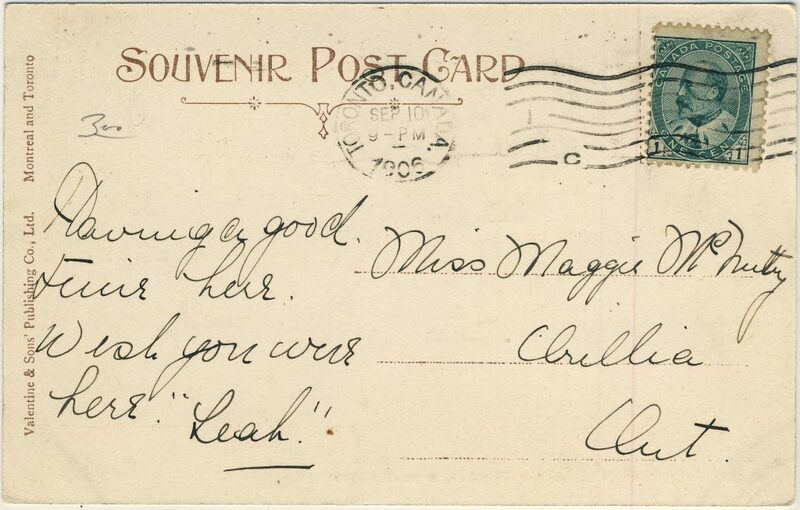 What other bygone conventions have you noticed in postcard letters? 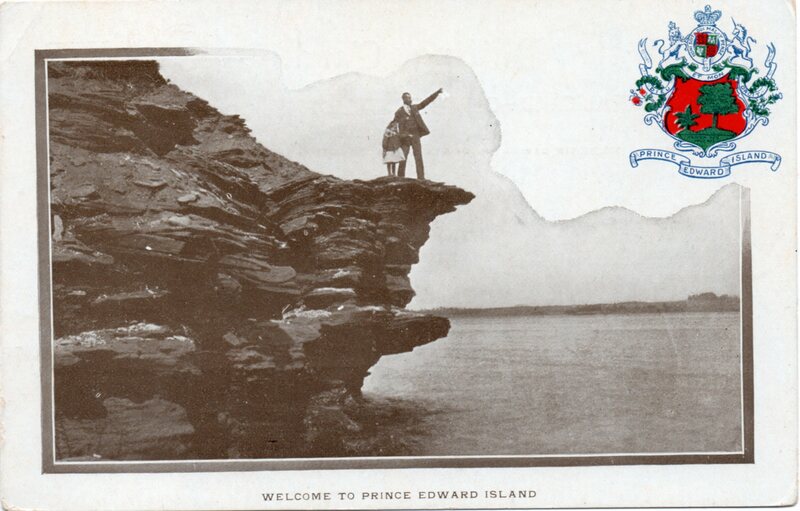 We’d be glad to get your examples and/or to hear about any other early examples of postcard messages that say “Having a good time; wish you were here”, or something close to it. 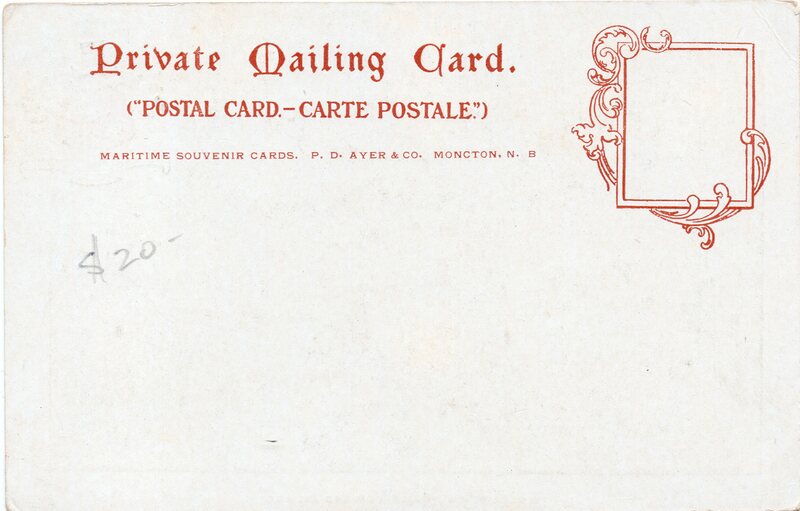 As the hundredth anniversary of 11 November 1918 — the end of the Great War — approaches, we will take a look back at what postcards of the time tell us about the four long years that took such a toll on the people of Canada, Newfoundland and many other countries. Coincidentally, the war years brought down the curtain on the “Golden Age of Postcards”; while the medium continued to be popular, the postcard industry as a whole no longer exhibited the vitality and variety of its pre-war heyday. 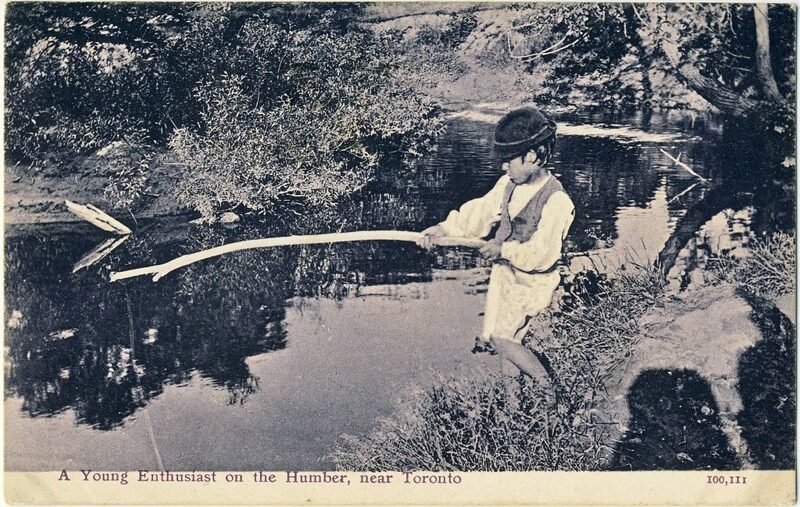 Postcards mailed in the summer of 1914 can provide us with insights into how ordinary people in the sedate turn-of-the-century world responded to the sudden intrusion of war into every aspect of life. Exhibit 1 is the Stedman Bros. “patriotic” shown below, which depicts departing Canadian soldiers while assertively proclaiming: “Canada Will Do Her Duty To Keep The Old Flag Flying”. Stedman Bros. no. 2539, with an added photographic image. On turning the postcard over, we find that it was posted at Toronto on 13 September 1914, barely a month after the state of war officially began. In fact, things had unravelled so quickly that the Canadian National Exhibition had no opportunity to re-think its 1914 theme of “PEACE YEAR”, neatly incorporated into the special CNE “slogan cancel” that we see here. 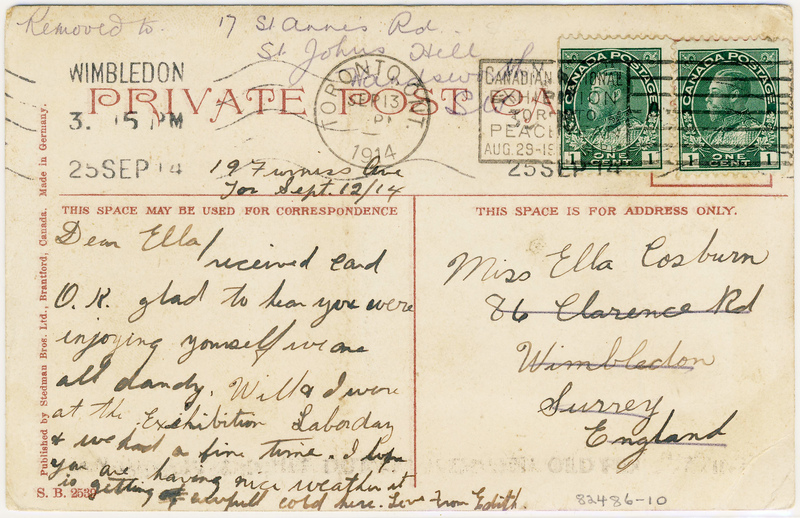 Verso image of the card as posted to Wimbledon, Surrey on 13 September 1914. The message itself is, of course, another place where we might hope to find reference to the big news from Europe. However, even though her words were destined for England, the writer didn’t acknowledge that anything out of the ordinary was going on. By the end of her note she had apparently run out of things to say — or so we might surmise, given that she filled the rest of her space in the time-honoured way, with bland observations about the weather! The story of the Queen’s Own Cameron Highlanders of Canada is well told on the regiment’s own website. 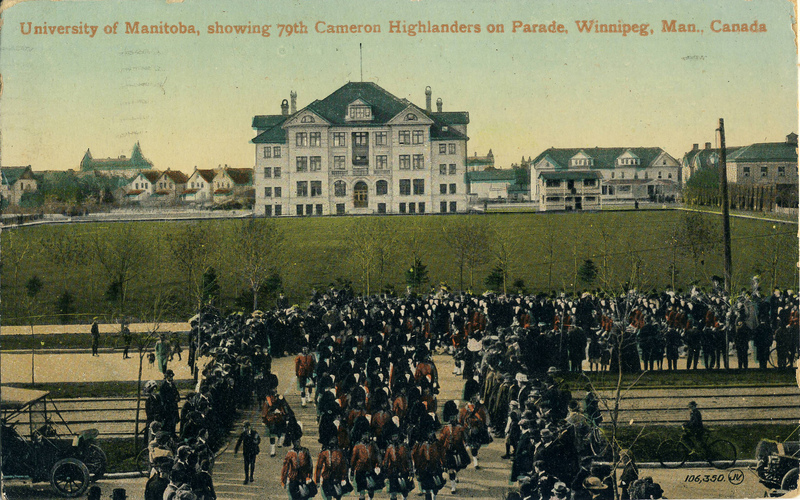 The Camerons, from Winnipeg, were the first Highland regiment in the West, having been founded on 1 February 1910. It is unlikely that the original members would have anticipated the sacrifices that they and their mates would be required to make within just a few short years. 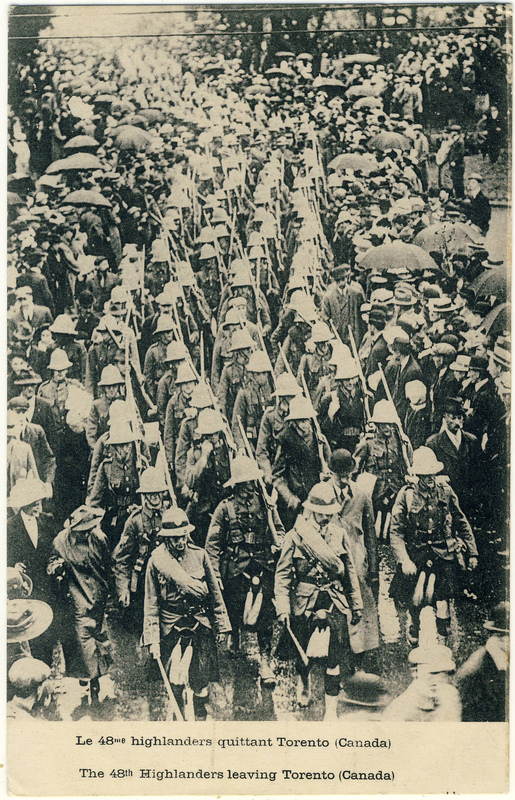 Even at the Decoration Day festivities on 10 May 1914, as depicted in the Maurice Lyall real photo postcard below, it is unlikely that the kilted marchers imagined that before the summer was out, some of them would be halfway across the country, and then halfway around the world, fighting for real. 10 May 1914. The building in the background was the University of Manitoba. 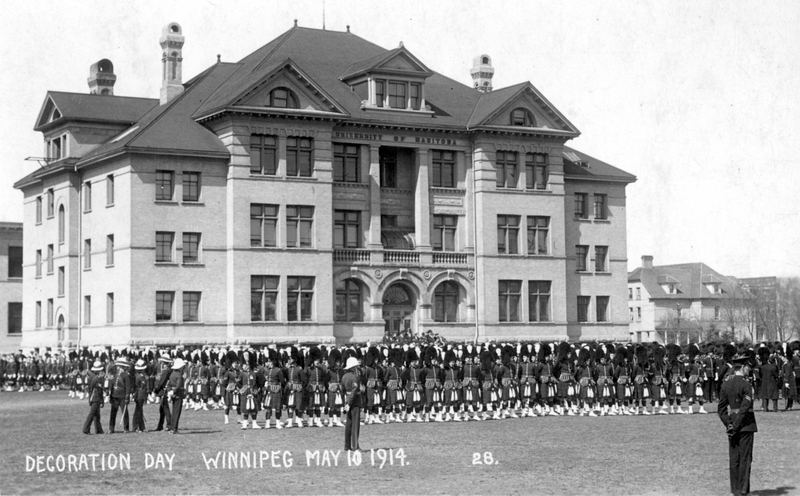 The Broadway Armoury stood directly across the street, on the site of what is now the Manitoba Legislature. Valentine & Sons card showing the soldiers standing on Broadway, looking out from the Drill Hall. Grande Allée, Quebec City. Patriotic postcard published by John E. Walsh, a Quebec stationer. 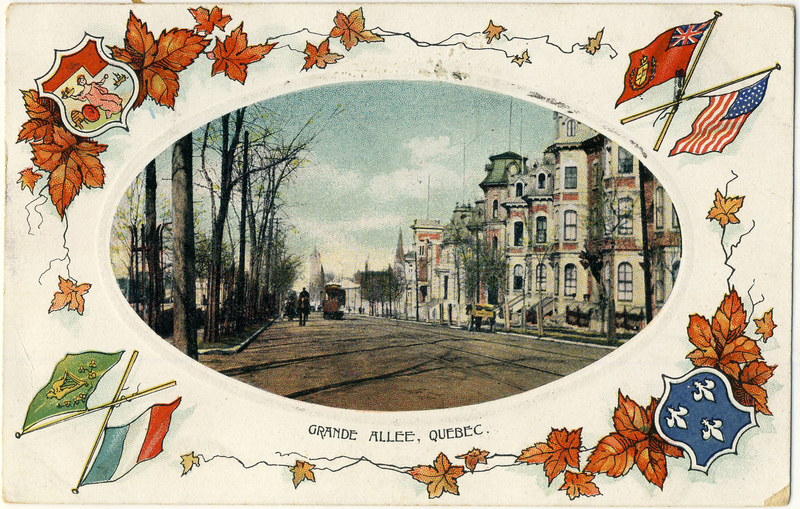 The first thing to note about the back of the Grande Allée card is that it is cancelled with a slogan cancel for the Quebec Provincial Exhibition (31 August – 5 September 1914). Unlike Toronto’s Canadian National Exhibition, the 1914 theme in Quebec was not “peace” but “health” (“l’année de la santé”). Back of the card, with a message from “R. M.”, then in training at Valcartier. The message is transcribed below. 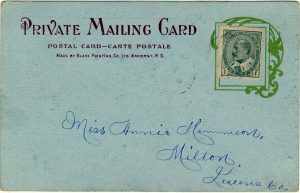 As the sender is identified by initials (“R. M.”) only, the only significant clue is the recipient, J[ohn] France Hughes of the Great-West Life Assurance Co. of Winnipeg, who turns out to have been an actuary with Great-West. Hughes was born in England around 1885, had emigrated around the turn of the century, and by the time of the postcard was married and living at 609 Spence Street, a house that still stands at (what is now) the corner of Cumberland Avenue. The “Overseas bunch” sounds as though it might have been an informal weekly gathering of British immigrants — as R. M. probably was (although, given his regimental affiliation, he may have been a Scot rather than an Englishman like Hughes). From the handwriting and the fact that his social circles included a well-paid insurance professional, one might also conclude that R. M. was likely well educated. 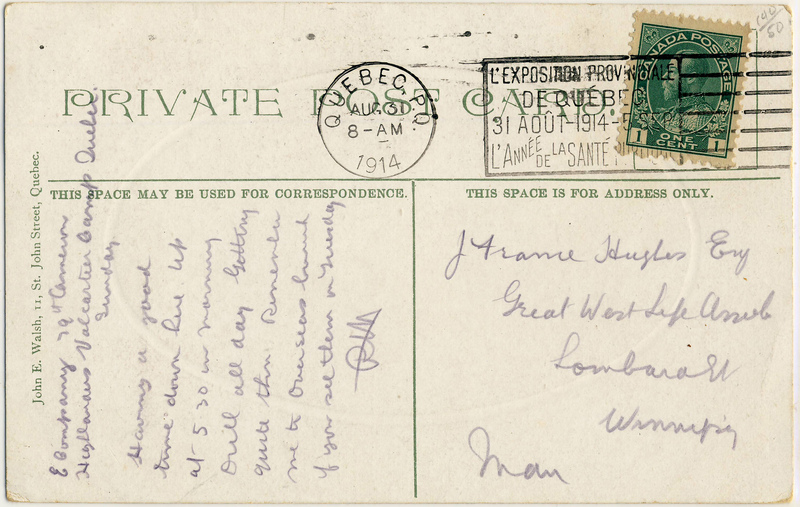 In any event, this is a good example of what we can learn from postcard messages about the very earliest days of the Great War. 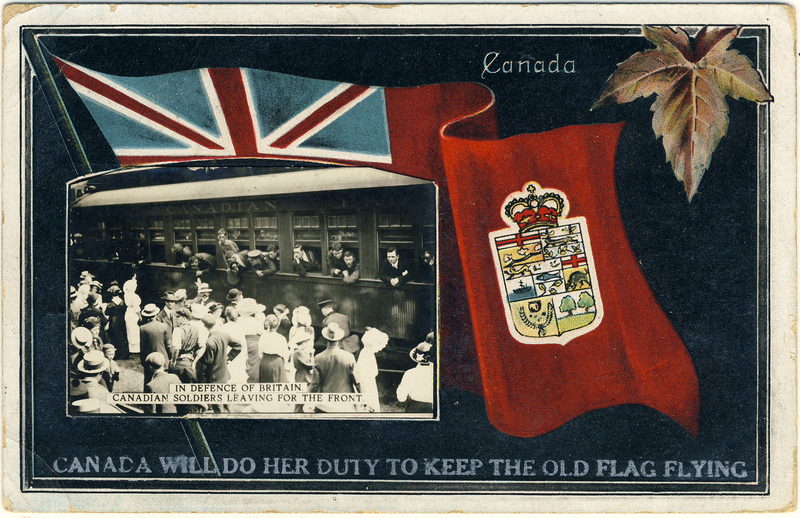 Canadian First World War collections often include postcards from other countries that depict the Canadian war effort. One scarce example is this collotype showing the 48th Highlanders — cousins of Winnipeg’s 79th — as they leave “Torento (Canada)”. One supposes this scene to be somewhere in the vicinity of Union Station, with the departing men parading in the pouring rain. Produced by Le Deley, imprimeur et éditeur (printer and publisher) at 127, boul. Sébastopol in Paris, this particular example was not used. A rainy day in Torento. “And very good reason to be” … indeed! 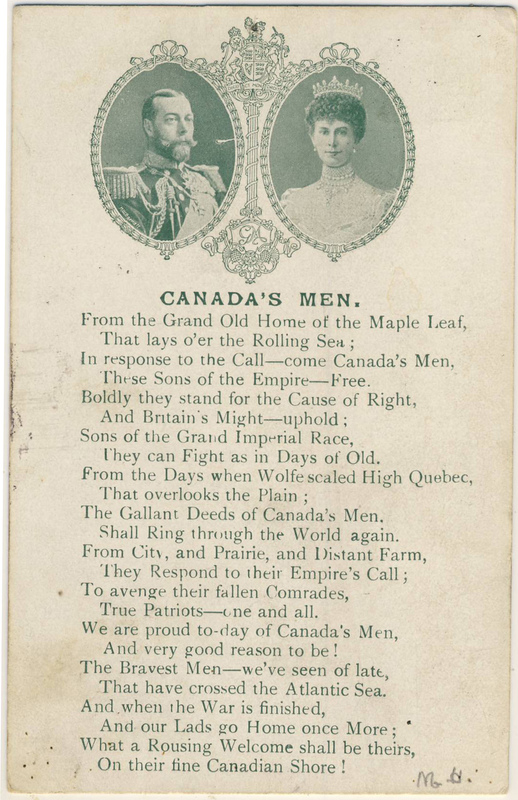 Our final example is a British card celebrating “Canada’s Men”, poetically, as “the Bravest Men — we’ve seen of late / That have crossed the Atlantic Sea”. The quality of some of the verse suggests that the poet may have been working to deadline, but overall the expression of Britain’s appreciation comes through clearly enough and, I’m sure, was much appreciated by its recipients. 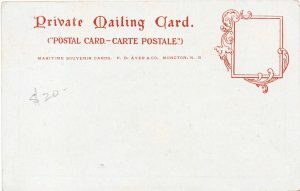 The card — the British publisher of which is not identified — was posted within the U.K. on 26 December 1916. We’ll try to post some other World War I postcards over the next few weeks, as the hundredth anniversary nears. Error: Error validating access token: Session has expired on Friday, 12-Apr-19 20:21:58 PDT. The current time is Friday, 19-Apr-19 21:17:54 PDT.